‘Scandinavia in the Tropics’ would be the right description for TufiDive Resort, which is still a well kept secret on the international dive market. 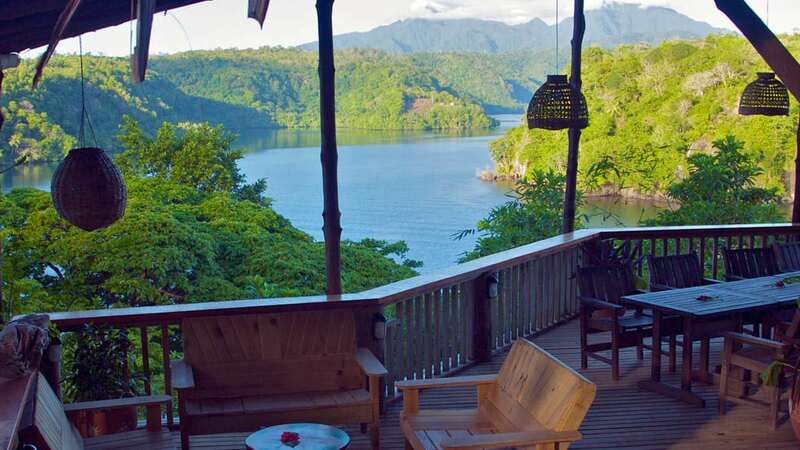 Tufi Dive Resort is nestled into the flanking slopes of Mount Trafalgar overlooking sheer rock faces that plunge into an enclosed picturesque fjord draped in exotic rainforest down to the water’s edge. The dive sites include these local walls, the outer reefs some 90 minutes away by boat, and two of the best wrecks in PNG, a Dutch cargo vessel and a B17 Bomber. Tufi Resort is one of the more luxurious dive resorts in PNG, and offers splendid 180-degree views over the fjord. The main building houses a dining room, lounge, bar, reception, office and laundry. 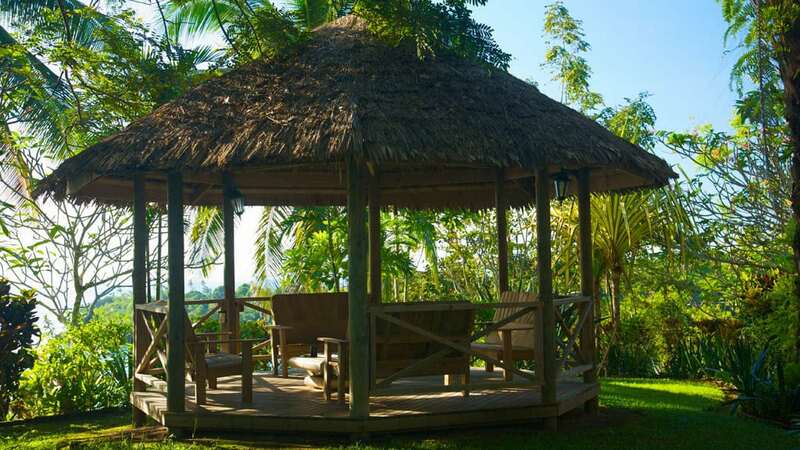 Built from timber to harmonise with tropical surroundings, it features traditional woven walls and exquisite carvings from many regions of PNG. It’s an inviting place to relax, relive the day’s diving experiences and plan tomorrow’s unique diving, trekking or kayaking adventures. Outside is a terraced dining area with spectacular views. In the evening sit back, relax by the bar, and enjoy the sunset. 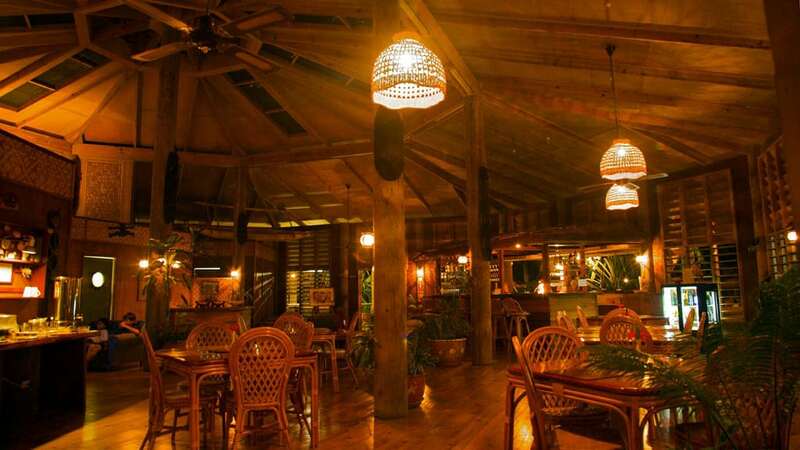 When you have worked up an appetite, the restaurant serves a lavish mix of local seafood, vegetables and real tropical fruits. The tariff includes all meals at the resort as well as lunch on dive excursions. The resort has a total of 28 rooms. 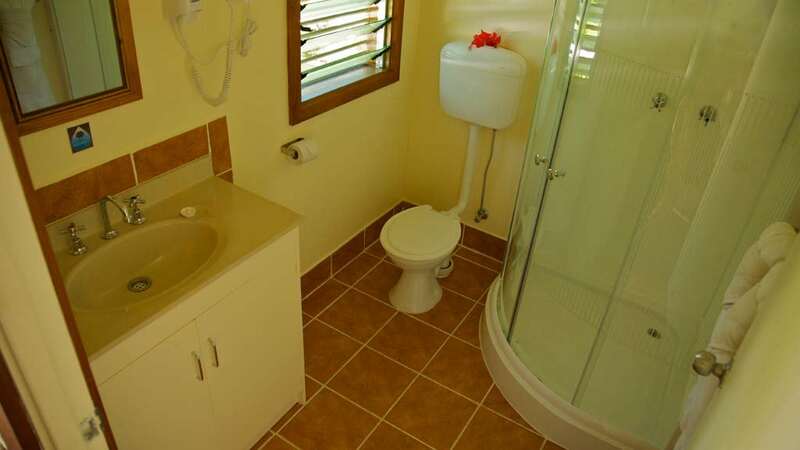 The Deluxe Bungalows have polished timber floors and the walls are lined with traditional woven material. All the creature comforts are available in all units, including insect screens, 24-hour electricity, air-conditioning, ceiling fan, hairdryer, hot & cold water showers, private bathroom, bar fridge, coffee and tea making facilities. Most bungalows have verandas overlooking the Coral Sea or Tufi Fjord. 10x Deluxe Bungalows (Units 8-12, 19-23) with 1 queen & 1 single bed, sea facing balconies. 6x Deluxe Rooms (Units 13-18) with 1 queen bed, sea facing balconies. 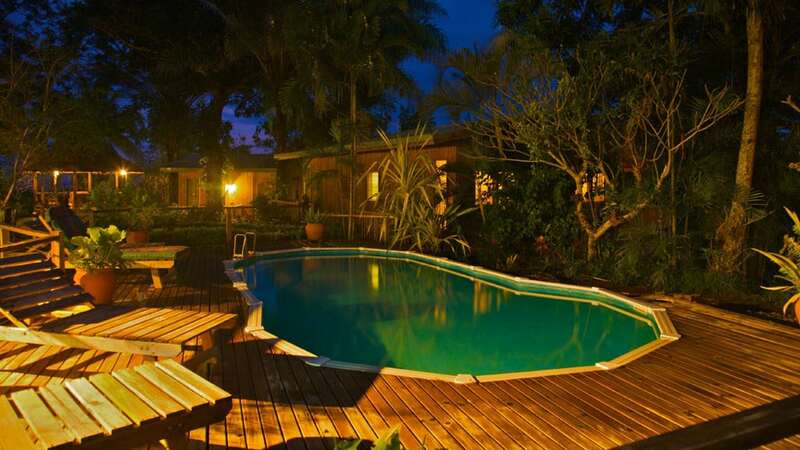 3x Deluxe Rooms (Units 1-3) with 1 double bed, balcony facing resort garden & main building. 9x Standard Rooms (Units 4-7, 24-28) with 1 queen bed, no balcony or sea views. This is a very remote area of PNG and the village is fringed by rugged mountain ranges on one side and the coastline on the other, so Tufi can only be accessed by aircraft. Currently, Airlines of PNG operates 3 services per week between Port Moresby & Tufi. With the current schedules, 7 and 10-night visits to Tufi generally work best. 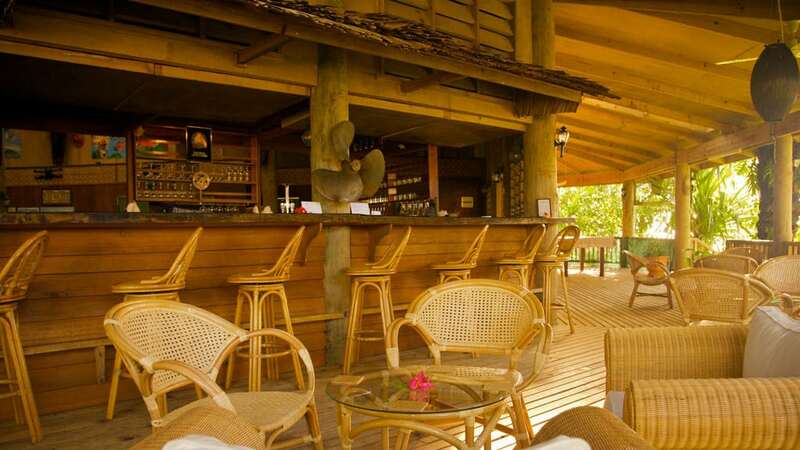 Tufi Dive Resort has reliable mobile phone reception and common areas have WiFi. The small community of Tufi is located 250km east north-east of Port Moresby on the northern coast, roughly half way between Lae & Alotau. Tufi is one of the most remote and isolated areas in PNG, accessible only by a twin otter aircraft that operates 3 days per week. There are no roads connecting Tufi with any other regions in PNG. 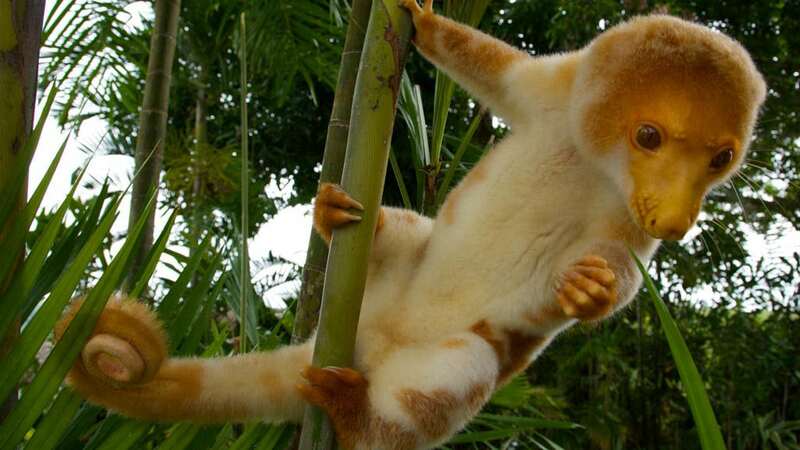 Tufi Dive Resort is nestled into the flanking slopes of Mount Trafalgar overlooking sheer rock faces that plunge into an enclosed picturesque fjord draped in exotic rainforest down to the water’s edge. Dives are organised directly through the resort. 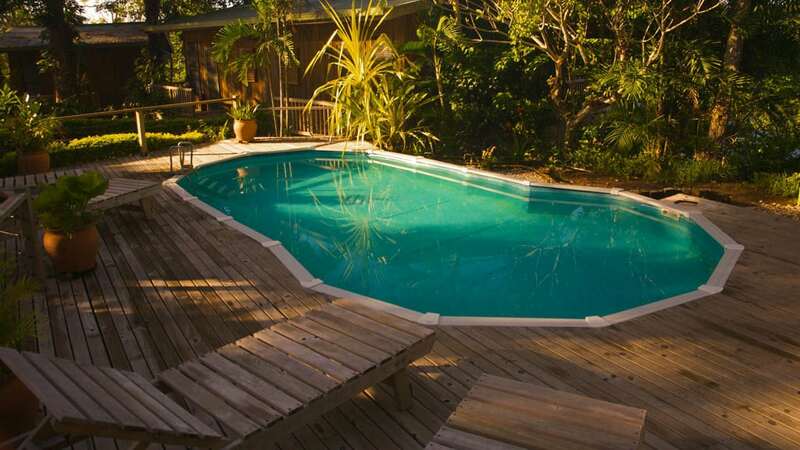 The Tufi Dive Centre is located down by the wharf, a 5-minute walk or drive from the resort. The shop is fully self-contained, there’s sufficient dive gear for hire and limited items for purchase available. It is generally recommended to bring your own dive gear and spares. The team at Tufi Dive consists of instructors, dive masters and dive guides. All diving is carried out under the guidance of a PADI open water instructor. Non-divers can snorkel in the fjords or join the scuba divers on their trips to outer reefs. As members of the PNG Divers Association, Tufi supports the Hyperbaric Chamber in Port Moresby. A contribution of 2 Kina per dive helps to maintain the facility. In an emergency, PNG offers excellent medivac facilities. It is mandatory that you have a suitable dive evacuation insurance before you travel to Tufi. Tufi caters for all experience and certification levels. Nitrox and rebreather diving is not available. Tank valves are INT. Mostly 11.5L aluminium tanks are available. The diver to guide ratio will depend on diver experiences. Rental dive gear is available and advance notice should be given for any gear rental requirements. Tufi has four customised dive boats. ‘Crystal’ at 9m (30Ft) is spacious and has comfortable seating. The boat features a shower and toilet facility and is well equipped with all safety features. A cruise speed of 20 knots provides divers less time travelling and more time underwater. All vessels are fully equipped with first aid kits and oxygen therapy equipment. The resort has other smaller multi-purpose boats equipped for diving, fishing or sightseeing. There are two distinctly different areas for diving at Tufi. The excellent outer reef system and the sheltered fjords around Tufi, ideal for “muck diving” opportunities. In addition, some wrecks can be dived on longer outings (min. 6 divers, additional charges apply). Most of the outer reefs are located up to 1.5 hours away from the dive shop. In this area, there are many reefs to choose from – an underwater landscape of sea mounts, pinnacles and vertical walls. Commercial fishing is rare here so these reefs are in pristine condition. Visibility is usually excellent, and the abundance of marine life is immediately evident with schools of pelagics (jacks, barracuda, tuna, dolphins), various shark species and a huge variety of healthy soft coral species with all the accompanying macro-life you would expect. In particular, Mullaway Reef and Bev’s Bommie are worth a special mention. In contrast to outer reef sites, a muck dive from the wharf offers the opportunity to encounter plenty of cool creatures – loads of pipe fish, stone-fish, ghost pipe fish, nudibranchs, flatworms and even some resident mandarin fish – plenty to keep the eyes peeled. The best time to dive Tufi is from October to April each year. Veale Reef: This is an excellent dive site on an astounding reef. In the Tufi region where typical visibility can be 40m/130Ft, this reef site often offers 50m/165Ft visibility. Dive this steep wall where hammerhead sharks, dogtooth tuna, Spanish mackerel, reef sharks and other pelagics compete for your attention. The reef top is carpeted with staghorn and plate corals in excellent condition. Cuts and crevices sculpture the drop-off and giant sponges are prolific. 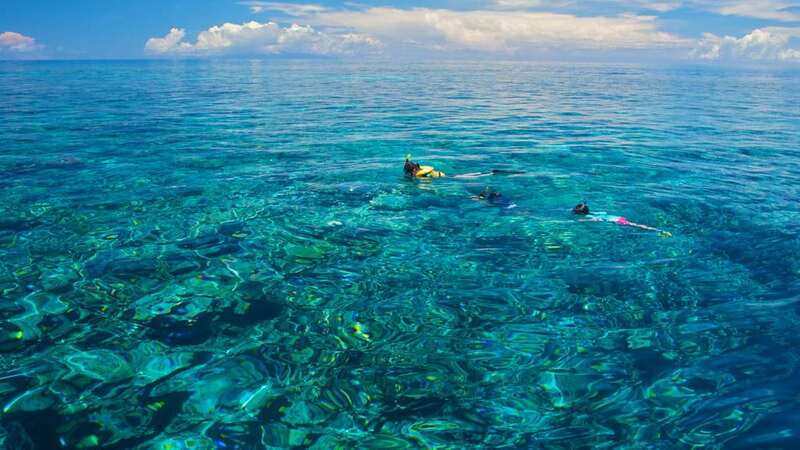 You can spend your safety stop amongst schools of small fish on the top of this pristine reef. Tufi Wharf: The resort wharf will never cease to amaze you. Perched at the tip of land dividing two fjords, this area was a United States base for P.T. Boats during WWII. Here you can dive in and out of the remains of two P.T. boats – still sporting a deck gun and loaded torpedo tube. In shallower waters, you can spend countless tanks of air and rolls of film with some fascinating “little critters” which include an amazing variety of nudibranchs. 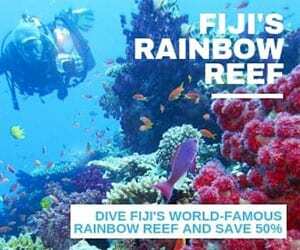 Stewart Reef: Tufi’s house reef offers superb diving both during the day and at night. 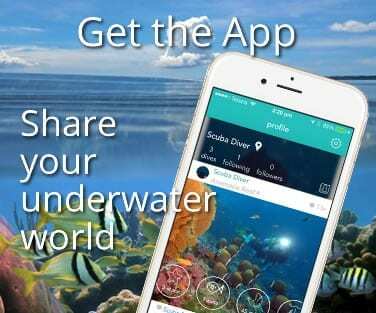 You can wall dive amongst soft corals, fans and a very healthy fish population. Excellent hard corals and sea whips entice you in visibility that seems endless. Epaulette sharks, decorator crabs, octopus and moray eels come out to play at night making this a great night dive. There are two fantastic wrecks, accessible from Tufi. The first, the “S’Jacob”, is rated as the most interesting wreck dive in PNG. It is a Dutch cargo vessel which lies in 55-60m. Though it is deep, every precaution will be taken to make this decompression dive a safe one. The other great dive is a B17 bomber “Black Jack”, which is one of the best-preserved B17 planes in PNG waters. It is right at the bottom of a teeming reef wall, which makes the deco stops on the way up a real pleasure. The B17 can be dived only from November to April. Both wreck dives are special charters (min. 6 divers, additional charges apply) and have to be booked in the resort. 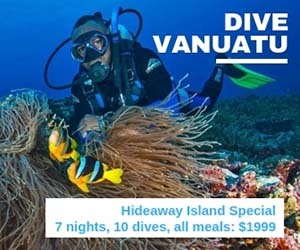 For visitors to PNG who want to experience a combination of great diving, trekking, kayaking and cultural activities without spending valuable time flying all over the place, Tufi Dive Resort is a great single-destination option.